You have to be open-minded when charity-shopping, I've always thought that if you go out with the aim of finding a particular item you are going to be disappointed, and "aimless" thrifting has worked well for me and resulted in some wonderful finds. This week I've been trawling the "proper" shops for a carry-on suitcase that meets Ryanair's size restrictions. It's probably a one-use-only item, and we already know I'm not happy paying full High Street prices, so when the cheapest I could find was £20 and was, quite frankly, ugly, I gave up and decided to just fit in a few charity shops before heading home, defeated. Out came my tape measure (an important part of my thrifting kit, second only to baby wipes), and happily it came in just under the Ryanair measurements. It was clean, not very beautiful, but not ugly either, and best of all it was £2.50. 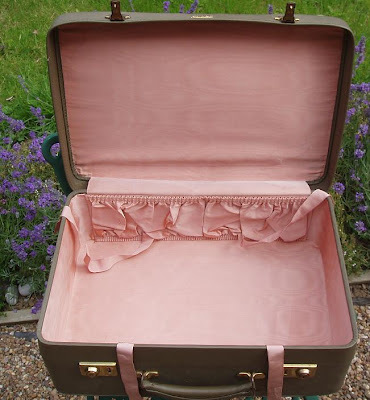 A brilliant find, and a big moneysaver for me, however, I like to blog about lovely things, so here is the rather nice vintage antler suitcase I found the following day for £1. It's basically clean and not smelly, so after a bit of a wipe-over this will be used for storing out-of-season clothing. Does it sound completely nuts if I say that it has a smiley face? Brilliant bargains for both but love the 2nd one. We've got one of those old brown suitcases in the loft which I must bring out to store in my twitty bits of tat (as my lovely partner likes to call my lovely finds, fabric or otherwise). Your red case seems to be grinning aswell. Happy luggage is the best kind! Love the Antler suitcase. Old suitcases make for fantastic storage.